“Nearly all men can stand adversity, but if you want to test a man’s character, give him power,” Abraham Lincoln reportedly said. If we update that quote to include women, then the list of the 100 Most Influential Georgians includes not just influence and power, but also the strength of character in our state. As we celebrate 20 years of honoring the state’s most influential, we have included many of the usual suspects – politicians, CEOs, college presidents – but we’ve also added a number of new names and faces to the list. All are people who have exhibited the character necessary to inspire, challenge, lead – and influence us. Some work behind the scenes and some are recognized in every corner of the Peach State. But they have one thing in common: Each of the 100 people you’ll find on the following pages has an enormous impact on the daily lives of Georgians. We at Georgia Trend do not take the task of selecting the most influential people in the state lightly. It’s a year-round process that involves lots of meetings and discussions. The original list is always more than 100, and we think the final group – subject to retirements, course corrections and shifts in power, not to mention late-in-the-year hirings and firings and a controversy or two – represents the realities of leadership, power, character and influence in Georgia. 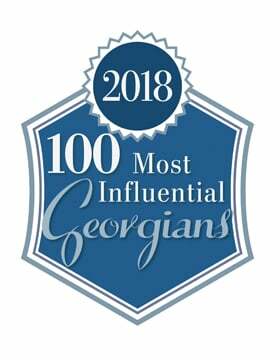 You’ll also find a list of Notable Georgians on page 52 – people who are making an impact in the state or have made an impression on the Georgia Trend staff this year. Thomas J. “Tim” Hynes Jr.